I took the day off work today to spend with my son since it's his birthday. I'm a firm believer in doing birthdays up right, ya know? If you saw my previous blog, you know he had a chocolate muffin cupcake for breakfast. He then got to go shopping with his grandma to pick out a birthday gift from her. Then we had lunch, and my mom treated us to her own cupcakes. Jacob licked this and said "Hey! That's not ice cream!" Nope! 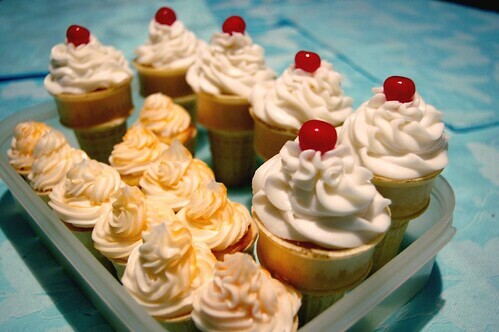 Mom baked cupcakes in ice cream cones and topped with buttercream icing. Afterwards, we went to see Clone Wars (finally!). Since it was the middle of a weekday, we were the only ones in the theater (yay!). And we're finishing off the night with a little Xbox. No better way to come down off that sugar high than to zone out in front of video games.